Shenzhen ([ʂə́n.ʈʂə̂n] ( listen)) is a major city in Guangdong Province, China; it forms part of the Pearl River Delta megalopolis, bordering Hong Kong to the south, Huizhou to the northeast, and Dongguan to the northwest. It holds sub-provincial administrative status, with powers slightly less than those of a province. Shenzhen, which roughly follows the administrative boundaries of Bao'an County, officially became a city in 1979, taking its name from the former county town, whose train station was the last stop on the Mainland Chinese section of the railway between Canton and Kowloon. In 1980, Shenzhen was established as China's first special economic zone. Shenzhen's registered population as of 2017[update] was estimated at 12,905,000. However, the Shenzhen Municipal Party Committee estimates that the population of Shenzhen is about 20 million, due to the large unregistered floating migrant population living in the city. Shenzhen was one of the fastest-growing cities in the world in the 1990s and the 2000s and has been ranked second on the list of ‘top 10 cities to visit in 2019 by Lonely Planet. Shenzhen's cityscape results from its vibrant economy - made possible by rapid foreign investment following the institution of the policy of "reform and opening-up" in 1979. The city is a leading global technology hub, dubbed by media as the next Silicon Valley. Shenzhen hosts the Shenzhen Stock Exchange as well as the headquarters of numerous multinational companies such as JXD, Vanke, Hytera, CIMC, SF Express, Shenzhen Airlines, Nepstar, Hasee, Ping An Bank, Ping An Insurance, China Merchants Bank, Tencent, ZTE, Huawei, DJI and BYD. Shenzhen ranks 14th in the 2019 Global Financial Centres Index. It has one of the busiest container ports in the world. Due to the city's growing economy, mainly in the technological industry, the city has been referred by media as "China's Silicon Valley". The earliest archaeological remains so far unearthed in the Shenzhen area are shards from a site at Xiantouling on Dapeng Bay, dating back to 5000 BC. From the Han dynasty (third century BC) onwards, the area around Shenzhen was a center of the salt monopoly, thus meriting special imperial protection. Salt pans are still visible around the Pearl River area to the west of the city and are commemorated in the name of Yantian District (盐田, meaning "salt fields"). The settlement at Nantou was the political center of the area from early antiquity. In the year 331 AD, six counties covering most of modern southeastern Guangdong were merged into one province or "jun" (郡) named Dongguan with its administrative center at Nantou. As well as being a center of the politically and fiscally critical salt trade, the area had strategic importance as a stopping off point for international trade. The main shipping route to India, Arabia and the Byzantine Empire started at Guangzhou. As early as the eighth century, chronicles recorded the Nantou area as being a major commercial center, and reported that all foreign ships in the Guangzhou trade would stop there. It was also as a naval defense center guarding the southern approaches to the Pearl River. Nantou was a major naval center at the mouth of the Pearl River in the Ming Dynasty. In this capacity it was heavily involved in 1521 in the successful Chinese action against the Portuguese Fleet under Fernão Pires de Andrade. This battle, called the Battle of Tunmen, was fought in the straits between Shekou and Nei Lingding Island. This area was also involved in the events surrounding the end of the Southern Song dynasty (1276–79). The imperial court, fleeing Kublai Khan’s forces, established itself in the Shenzhen area. Lu Xiufu, the then-chief minister, realized all was lost and knew the Mongolian forces would soon take over the area, he preferred suicide instead of the emperor being captured which might have brought shame to the dynasty. He jumped off a cliff with Emperor Bing, aged 7, the last emperor of the Southern Song Dynasty strapped to his back, killing both. In the late 19th century the Chiu or Zhao (Zhao was also the Song Imperial surname) clan in Hong Kong identified that Chiwan, an area near Shekou as the final resting place of the Emperor and built a tomb for him. The tomb, since restored, is still at the same location. Contrary to a common misconception of Shenzhen being a fishing village prior to becoming a city, Shenzhen was a regional market town that had been the county town of Bao'an since 1953. In November 1979, Bao'an County (宝安县) was promoted to prefecture level, directly governed by Guangdong province. It was renamed Shenzhen, after Shenzhen town. The administrative centre of the county stood approximately around present location of the Dongmen. Shenzhen was singled out to be the first of the five Special Economic Zones (SEZ) in May 1980. Initially, the SEZ comprised an area of only 327.5 km2 (126.4 sq mi) of southern Shenzhen, covering the current Luohu, Futian, Nanshan and Yantian districts. The SEZ was promoted by Deng Xiaoping and created to be an experimental ground for the practice of market capitalism within a community guided by the ideals of "socialism with Chinese characteristics". In 1996 and early 1997, the Shenzhen Guesthouse Hotel in Shenzhen was home to the Provisional Legislative Council and Provisional Executive Council of Hong Kong in preparation for the handover of Hong Kong in 1997. By 2001, as a result of Shenzhen's increasing economic prospects, increasing numbers of migrants from Mainland China chose to go to Shenzhen and stay there instead of trying to illegally cross into Hong Kong. There were 9,000 captured border-crossers in 2000, while the same figure was 16,000 in 1991. Shenzhen is located within the Pearl River Delta, bordering Hong Kong to the south, Huizhou to the north and northeast, Dongguan to the north and northwest. Lingdingyang and Pearl River to the west and Mirs Bay to the east and roughly 100 kilometres (62 mi) southeast of the provincial capital of Guangzhou. As of the end of 2017, the resident population of Shenzhen was 12,528,300, of which the registered population was 4,472,200, the actual administrative population was over 20 million. It makes up part of Pearl Delta River built-up area with 44,738,513 inhabitants, spread over 9 municipalities (including Macau). The city is elongated measuring 81.4 kilometers from east to west while the shortest section from north to south is 10.8 kilometers. Over 160 rivers or channels flow through Shenzhen. There are 24 reservoirs within the city limits with a total capacity of 525 million tonnes. Notable rivers in Shenzhen include the Shenzhen River, Maozhou River and Longgang River. Although Shenzhen is situated about a degree south of the Tropic of Cancer, due to the Siberian anticyclone it has a warm, monsoon-influenced, humid subtropical climate (Köppen Cwa). 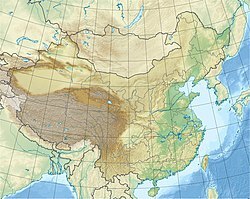 Winters are mild and relatively dry, due in part to the influence of the South China Sea, and frost is very rare; it begins dry but becomes progressively more humid and overcast. However, fog is most frequent in winter and spring, with 106 days per year reporting some fog. Early spring is the cloudiest time of year, and rainfall begins to dramatically increase in April; the rainy season lasts until late September to early October. The monsoon reaches its peak intensity in the summer months, when the city also experiences very humid, and hot, but moderated, conditions; there are only 2.4 days of 35 °C (95 °F)+ temperatures. The region is prone to torrential rain as well, with 9.7 days that have 50 mm (1.97 in) or more of rain, and 2.2 days of at least 100 mm (3.94 in). The latter portion of autumn is dry. The annual precipitation averages at around 1,970 mm (78 in), some of which is delivered in typhoons that strike from the east during summer and early autumn. Extreme temperatures have ranged from 0.2 °C (32 °F) on 11 February 1957 to 38.7 °C (102 °F) on 10 July 1980. The politics of Shenzhen is structured in a parallel party-government system, in which the Party Committee Secretary, officially termed the Communist Party of China Shenzhen Municipal Committee Secretary (currently Wang Weizhong), outranks the Mayor (currently Chen Rugui). The party's standing committee acts as the top policy formulation body, and is typically composed of 11 members. * — The stats does not includes the subordinated new district. All new district are management areas; not administrative divisions registered under the Ministry of Civil Affairs. The Special Economic Zone (SEZ) comprised only Luohu, Futian, Nanshan, and Yantian districts until 1 July 2010, when the SEZ was expanded to include all the other districts, a five-fold increase over its pre-expansion size. Land borders between Shenzhen SEZ and the rest of China existed before 2010. The border was known as 二线关 (pinyin: èr xiàn guān). The border was set up since the establishment of the SEZ. Initially, the border control was relatively strict, requiring non-Shenzhen citizens to obtain special permissions for entering. Over the years, border controls have gradually weakened, and permission requirement has been abandoned. On 1 July 2010, the original SEZ border control was cancelled, and the Shenzhen Special Economic Zone was expanded to the whole city. The area of Shenzhen SEZ thus increased from 396 square kilometres (153 sq mi) to 1,953 square kilometres (754 sq mi). Since June 2015 the existing unused border structures have been demolished and are being transformed into urban greenspaces and parks. On 15 January 2018, the State Council approved the removal of the barbed wire fence set up to mark the boundary of the SEZ. Although the Shenzhen Special Economic Zone have been extended to cover the whole of Shenzhen, colloquially Shenzhen is still said to be separated into two areas, with the original four districts comprising the SEZ before 2010 as "关内" (pinyin: guān nèi; literally: 'within the border') and the rest known as "关外" (pinyin: guān wài; literally: 'outside of the border'). Shenzhen was the first of the Special Economic Zones to be established by Deng Xiaoping and it showed the most rapid growth, averaging at a very high growth rate of 40% per year between 1981 and 1993, compared to the average GDP growth of 9.8% for the country as a whole. The economic growth later slowed after this early breakneck pace. From 2001 to 2005, Shenzhen's overall GDP grew by 16.3 percent yearly on average. Since 2012, economic growth has slowed to around 10% per year. In 2016, Shenzhen's overall GDP grew about 8% per year. Shenzhen's economic output is ranked 3rd among the 659 Chinese cities (behind Beijing, Shanghai). The city was ranked 19th in the 2016 Global Financial Centres Index. In the 2017 Global Financial Centres Index, Shenzhen was ranked as having the 22nd most competitive financial center in the world. In 2016, Shenzhen's GDP totaled $303.37 billion, putting it on par with a mid-sized Chinese province by terms of total GDP. Its total economic output is higher than that of small countries like Portugal, the Republic of Ireland, and Vietnam. Its PPP per-capita GDP was $49,185 (unregistered migrant population not counted) as of 2016[update], on par with developed countries such as Australia and Germany. In 2017, Shenzhen's economic output totalled $338 billion, surpassing that of Guangzhou, Hong Kong for the first time and ranked No.3 in China, only behind Shanghai and Beijing. Its new status will allow the city to become the leading economic engine in China's Greater Bay Area Initiative. The Shenzhen Stock Exchange (SZSE) is a mutualized national stock exchange under the China Securities Regulatory Commission (CSRC) that provides a venue for securities trading. A broad spectrum of market participants, including 540 listed companies, 35 million registered investors and 177 exchange members, create the market. Since its creation in 1990, the SZSE has grown with a market capitalization around 1 trillion yuan (US$122 billion). On a daily basis, around 600,000 deals, valued at US$807 million, trade on the SZSE. Shenzhen is a major manufacturing center in China. 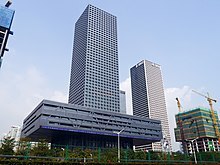 In the financial sector, large Chinese banks such as Ping An Bank and China Merchants Bank have their headquarters in Shenzhen. The Port of Shenzhen handled a record number of containers with rising trade increased cargo shipments in 2005, ranking it as the world's third-busiest port. China International Marine Containers, and other operators of the port handled 16.2 million standard 20-foot (6.1 m) boxes last year, a 19 per cent increase. Investors in Shenzhen are expanding to take advantage of rising volume. Yantian International Container Terminals, Chiwan Container terminals, Shekou Container Terminals, China Merchants Port and Shenzhen Haixing (Mawan port) are the major port terminals in Shenzhen. In the 1990s, Shenzhen was described as constructing "one high-rise a day and one boulevard every three days". The Shenzhen's rapidly growing skyline is regarded among the best in the world. It currently has 59 buildings at over 200 meters tall, including the 599 m tall Ping An Finance Centre (the fourth-tallest building in the world) and the 442 m tall Kingkey 100 (renamed to KK100), the 14th-tallest building in the world. Shenzhen's most important economic sector lies in its role as the headquarters for many of China's high-tech companies. Shenzhen is home to many internationally successful high-tech companies, including Huawei, Tencent, BYD, Konka, Skyworth, ZTE, Gionee, TP-Link, DJI, BGI (Beijing Genomics Institute), OnePlus, etc. Taiwan's largest company, Hon Hai Group, has a large manufacturing plant based in Shenzhen. Many foreign high-tech companies have their China operations centers located in the Science and Technology Park of the Nanshan District. Due to its unique status as the first Chinese 'Special Economic Zone', Shenzhen is also an extremely fertile ground for startups, be it by Chinese or foreign entrepreneurs. Successful startups include Petcube, Palette, WearVigo, Notch and Makeblock. Shenzhen is also the product development base of the hardware startup accelerator, HAX Accelerator (formerly HAXLR8R). Shenzhen Hi-Tech Industrial Park (SHIP) was founded in September 1996. It covers an area of 11.5 km2 (4.4 sq mi). Industries encouraged in the zone include biotechnology/pharmaceuticals, building/construction materials, chemicals production and processing, computer software, electronics assembly & manufacturing, instruments & industrial equipment production, medical equipment and supplies, research and development, telecommunications equipment. Shenzhen Software Park is integrated with Shenzhen Hi-Tech Industry Park, an important vehicle established by Shenzhen Municipal Government to support the development of software industry. The Park was approved to be the base of software production of the National Plan in 2001. The distance between the 010 National Highway and the zone is 20.8 km (12.9 mi). The zone is situated 22 km (14 mi) from the Shenzhen Bao'an International Airport. Hong Kong and Shenzhen have close business, trade, and social links as demonstrated by the statistics presented below. Except where noted the statistics are taken from sections of the Hong Kong Government website. As of September 2016, there are nine crossing points on the boundary between Shenzhen and Hong Kong, among which six are land connections. From west to east these include the Shenzhen Bay Port, Futian Port, Huanggang Port, Man Kam To Port, Luohu Port and Shatoujiao Port. On either sides of each of these ports of entry are road and/or rail transportation. In 2006, there were around 20,500 daily vehicular crossings of the boundary in each direction. Of these 65 percent were cargo vehicles, 27 percent cars and the remainder buses and coaches. The Huanggang crossing was most heavily used at 76 percent of the total, followed by the Futian crossing at 18 percent and Shatoujiao at 6 percent. Of the cargo vehicles, 12,000 per day were container carrying and, using a rate of 1.44 teus/vehicle, this results in 17,000 teus/day across the boundary, while Hong Kong port handled 23,000 teus/day during 2006, excluding trans-shipment trade. Also in 2006 the average daily passenger flow through the four connections open at that time was over 200,000 in each direction of which 63 percent used the Luohu rail connection and 33 percent the Huanggang road connection. Naturally, such high volumes require special handling, and the largest group of people crossing the boundary, Hong Kong residents with Chinese citizenship, use only a biometric ID card (Home Return Permit) and a thumb print reader. As a point of comparison, Hong Kong’s Chek Lap Kok Airport, the 5th busiest international airport in the world, handled 59,000 passengers per day in each direction. Hong Kong conducts regular surveys of cross-boundary passenger movements, with the most recent being in 2003, although the 2007 survey will be reported on soon[when?]. In 2003 the boundary crossings for Hong Kong Residents living in Hong Kong made 78 percent of the trips, up by 33 percent from 1999, whereas Hong Kong and Chinese residents of China made up 20 percent in 2006, an increase of 140 percent above the 1999 figure. Since that time movement has been made much easier for China residents, and so that group have probably increased further still. Other nationalities made up 2 percent of boundary crossings. Of these trips 67 percent were associated with Shenzhen and 42 percent were for business or work purposes. Of the non-business trips about one third were to visit friends and relatives and the remainder for leisure. After Shenzhen's attempts to be included in the Hong Kong-Zhuhai-Macau Bridge project were rejected in 2004, a separate bridge was conceived connecting Shenzhen on the Eastern side of the Pearl River Delta with the city of Zhongshan on the Western side: the Shenzhen-Zhongshan Bridge. Qianhai, which means foresea in Chinese language, formally known as the Qianhai Shenzhen-Hong Kong Modern Service Industries Cooperation Zone, is "a useful exploration for China to create a new opening up layout with a more open economic system." A 15 km2 (5.8 sq mi) area located in western Shenzhen, Qianhai lies at the heart of the Pearl River Delta, adjacent to Shenzhen international airport. Strategically positioned as a zone for the innovation and development of modern services, Qianhai will facilitate closer cooperation between Hong Kong and mainland China, as well as act as the catalyst for industrial reform in the Pearl River Delta. With the goal of loosening capital account restrictions, Qianhai authorities have indicated that Hong Kong banks will be allowed to extend commercial RMB loans to Qianhai-based onshore mainland entities. The People's Bank of China has also indicated that such loans will for the first time not be subject to the benchmark rates set by the central bank for all other loans in the rest of China. According to Anita Fung from HSBC, "This new measure on cross-border lending will enhance the co-operation between Hong Kong and Shenzhen and accelerate cross-border convergence." Shenzhen has seen its population and activity develop rapidly since the establishment of the SEZ. Shenzhen has an official population of over 10 million. About six million are registered non-local migrant workers who may return to their home town/city on the weekends and live in factory dormitories during the week. The population growth of Shenzhen proper slowed down to less than one percent per year by 2013 with growth spilling over the municipal border and forming a contiguous urban area with southern Dongguan and Huizhou Cities. However, due to the large unregistered floating migrant population living in the city, official estimates put Shenzhen's population at around 20 million inside the administrative area given at any specific moment. Shenzhen is the largest migrant city in China. There had been migration into southern Guangdong province and what is now Shenzhen since the Southern Song dynasty (1127–1279) but the numbers increased dramatically since Shenzhen was established in the 1980s. In Guangdong province, it is the only city where the local languages (Cantonese, Shenzhen-Hakka and Teochew) is not the main language; it is Mandarin that is mostly spoken, with migrants/immigrants from all over China. At present, the average age in Shenzhen is less than 30. The age range is as follows: 8.49% between the age of 0 and 14, 88.41% between the age of 15 and 59, and 3.1% aged 65 or above. The population structure has great diversity, ranging from intellectuals with a high level of education to migrant workers with poor education. It was reported in June 2007 that more than 20 percent of China's PhD graduates had worked in Shenzhen. Shenzhen was also elected as one of the top 10 cities in China for expatriates. Expatriates choose Shenzhen as a place to settle because of the city’s job opportunities as well as the culture’s tolerance and open-mindedness, and it was even voted China’s Most Dynamic City and the City Most Favored by Migrant Workers in 2014. According to a survey by the Hong Kong Planning Department, the number of cross-border commuters increased from about 7,500 in 1999 to 44,600 in 2009. More than half of them lived in Shenzhen. Though neighboring each other, daily commuters still need to pass through customs and immigration checkpoints, as travel between the SEZ and the Hong Kong Special Administrative Region (SAR) is restricted. The encompassing metropolitan area was estimated by the OECD (Organisation for Economic Co-operation and Development) to have, as of 2010[update], a population of 23.3 million. 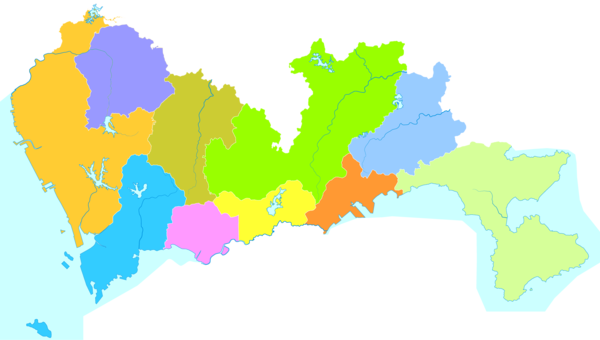 Prior to the establishment of Special Economic Zone, the indigenous local communities could be divided into Cantonese and Hakka speakers, which were two cultural and linguistic sub-ethnic groups vernacular to Guangdong province. Two Cantonese varieties were spoken locally. One was a fairly standard version, known as standard Cantonese. The other, spoken by several villages south of Fuhua Rd. was called Weitou dialect. Two or three Hong Kong villages south of the Shenzhen River also speak this dialect. This is consistent with the area settled by people who accompanied the Southern Song court to the south in the late 13th century. Younger generations of the Cantonese communities now speak the more standard version. Today, some aboriginals of the Cantonese and Hakka speaking communities disperse into urban settlements (e.g. apartments and villas), but most of them are still clustering in their traditional urban and suburban villages. The influx of migrants from other parts of the country has drastically altered the city's linguistic landscape, as Shenzhen has undergone a language shift towards Mandarin, which was both promoted by the Chinese Central Government as a national lingua franca and natively spoken by most of the out-of-province immigrants and their descendants. Despite the ubiquity of Mandarin Chinese, local languages such as Cantonese, Hakka, and Teochew are still commonly spoken among locals. Hokkien and Xiang are also sometimes observed. Mandarin native speakers, whose majority are out-of-province immigrants are found unwilling to learn Cantonese, Hakka or Teochew, due to the perceived complexities of learning the dialects as well as Mandarin's official use, educational priority, and use as a lingua franca. However, in recent years multilingualism is on the rise as descendants of immigrants begin to assimilate into the local culture through friends, television and other media. According to the Department of Religious Affairs of the Shenzhen Municipal People's Government, the two main religions present in Shenzhen are Buddhism and Taoism. Every district also has Protestant churches, Catholic churches, and mosques. According to a 2010 survey held by the University of Southern California, approximately 37% of Shenzhen's residents were practitioners of Chinese folk religions, 26% were Buddhists, 18% Taoists, 2% Christians and 2% Muslims; 15% were unaffiliated to any religion. Most new migrants to Shenzhen rely upon the common spiritual heritage drawn from Chinese folk religion. Shenzhen also hosts the headquarters of the Holy Confucian Church, established in 2009. In general, Shenzhen is a relatively safe city. However, in districts such as Bao'an and Longgang, the number of robberies, extortion, kidnapping, and fraud exceeds the national average. In the central part of the Luohu District, especially in the neighborhoods around the Shenzhen Railway Station, Shenzhen Bus Terminal, and the Luohu Commercial City Shopping Center, pickpocketing, prostitution, drug trafficking, fraud, and the sale of counterfeit bills are common. In addition, Luohu is a major center for trade in counterfeit goods and abundant in its nightclubs, bars, and karaoke salons, which not only does it attract Shenzhen residents, but also residents from neighboring Hong Kong, which may attract criminal elements. The Nanshan District has a large concentration of foreigners, and is known for its abundance of prostitutes and beggars. Along with local gangs in Shenzhen, there is a notable presence of triads: notably Wo Shing Wo, Big Circle Gang, Sun Yee On, 14K, and Shui Fong. The level of corruption in the government is usually high, as seen in the arrest of the then-mayor of Shenzhen, Xu Zongheng, for accepting bribes in June 2009, as well as arrests and convictions of Li Yugo, the former head of the largest state-owned construction corporation in the city, and Zhao Yutsun, a customs officer of the city, for the same reasons. In 2009, there were 974 preschool educational institutions in Shenzhen: 346 elementary schools with 589,500 students, 285 primary and secondary schools with 316,000 students, and 20 secondary vocational schools with 47,000 students. There were also nine full-time higher education institutions based in the city, one higher education institution with correspondence education and 109 higher education institution branches (in addition, 52 Chinese and foreign universities conduct training and research in the Shenzhen Virtual University Park). In total, 67,000 students studied at Shenzhen universities (more than 600 thousand students were enrolled in correspondence courses). Shenzhen has an extensive public transport system, largely based on rapid transit, buses and taxis. Payment for most of these transportation methods can be made by using a Shenzhen Tong card. In 2018, metro stations and buses added QR code scanners, allowing users to pay with QR codes generated by WeChat mini programs. The Shenzhen Metro system opened on 28 December 2004. Phase I had only two lines: the Luobao line (now Line 1) and Longhua line (now Line 4). The Luobao line ran from Luohu (interchange for Lo Wu MTR station and Shenzhen railway station) to Window of the World (Overseas Chinese Town). The Longhua line ran from Huang Gang (now Futian Checkpoint) to Shaonian Gong (now Children's Palace). In June 2011, the Shenzhen Metro extended Line 1 and Line 4. Line 1 runs from Luohu to Shenzhen Bao'an Airport and Line 4 (now operated by Hong Kong MTR) runs from Futian Checkpoint to Qinghu. Also in June 2011, three lines of Phase II opened before the 26th summer Universiade. They are Line 2 (from Chiwan to Xinxiu), Line 3 (from Yitian to Shuanglong), and Line 5 (from Qianhaiwan to Huangbeiling). The first batch of lines in Phase III, Line 11, opened in June 2016. Lines 7 and 9 opened at the end of 2016. By then the Shenzhen Metro currently has 8 lines, 199 stations, and 286 kilometres (178 mi) of lines in operation. This made the Shenzhen Metro one of the top ten longest metro systems in the world. Several additional lines and extensions as part of the second batch of Phase III expansion are under construction and will open by 2020. A number of Phase IV lines started construction in January 2018. Bus services in Shenzhen began in 1975, and now have expanded to a network consisting of near 1000 routes. Three franchised companies, Shenzhen Bus Group, Shenzhen Eastern Bus and Shenzhen Western Bus operate most of the routes, and the remaining routes are operated by a few private companies. Bus fares usually range from ¥2 to ¥10, except for branches, where the fare can be ¥1 or ¥2, and privately-operated premium services, which may be charged as much as ¥30. Red taxis and Green taxis are fuel taxis united together by governments in May 2017. Blue taxis are electric vehicles and fuel surcharge does not apply on them. The taxi fare consists of 2 parts, ¥10 for up to 2 km(about 1.24 mile) first and ¥2.6/km(about ¥4.18/mile) for the distance remained. Extra ¥2 to ¥4 is needed for fuel taxis as fuel surcharge according to local price of fuel. Shenzhen is a leader in electrifying its public transportation. As of January 2019, it has the largest fleet of electric buses in the world with more than 16,000 electric buses. Moreover, 99% of its taxis have also been converted to electric vehicles. Since February 2003, the road border crossing at Huanggang and Lok Ma Chau in Hong Kong has been open 24 hours a day. The journey can be made by private vehicle or by bus. On 15 August 2007, the Lok Ma Chau-Huanggang pedestrian border crossing opened, linking Lok Ma Chau Station with Huanggang. With the opening of the crossing, shuttle buses between Lok Ma Chau transport interchange and Huanggang were terminated. The planned Shenzhen–Zhongshan Bridge will connect Shenzhen on the Eastern side of the Pearl River Delta with the city of Zhongshan on the Western side. It will consist of a series of bridges and tunnels, starting from Bao'an International Airport on the Shenzhen side. Construction of the proposed 51 km (32 mi) eight-lane link is scheduled to start in 2015, with completion scheduled for 2021. Taxis are metered and come in 3 colors, red, green and blue, all of which may travel throughout the city. Red taxis and green taxis united in May 2017. Blue taxis are electric-powered that costs similar to the red and green ones, only having no fuel surcharge levied on. There are also frequent bus and van services from Hong Kong International Airport to Huanggang and most major hotels in Shenzhen. A bus service operated by Chinalink Bus Company operates from Kowloon Station on the Airport Express MTR line (below Elements Mall) direct to the Shenzhen International Airport. As of 29 December 2014, Shenzhen banned passenger vehicles with license plates issued in other places from four of Shenzhen's main districts during peak times on working days. Shenzhen city has five large railway stations located in different parts of the city to service destinations in different directions. The oldest of these, the Shenzhen railway station, is located at the junction of Jianshe Road, Heping Road and Renmin Nan Road and mostly services medium-speed long distance trains and provides links to different parts of China. There are frequent high speed trains to Guangzhou, as well as long-distance trains to Beijing, Shanghai, Changsha, Jiujiang, Maoming, Shantou and other destinations. The trains from Hong Kong's Hung Hom MTR station to the Lo Wu and Lok Ma Chau border crossings take 43 minutes and 45 minutes, respectively. Shenzhen West railway station is located in Qianhai, Nanshan. This station is used for a small number of long distance trains, such as ones to Hefei. Shenzhen North railway station opened in 2011 in Longhua. The station is currently handling high-speed trains to Guangzhou South, Guangzhou North, Changsha, Wuhan, Beijing and intermediate stations on the Beijing–Guangzhou–Shenzhen–Hong Kong HSR. Shenzhen East railway station was opened in December 2012. It was originally called Buji station after the suburb it is located and was a Grade 3 station along the Guangshen railway with no passenger services. Now after massive renovations, it currently handles mostly regional rail services. Pingshan railway station was completed in 2013 to serve high-speed trains on the Xiamen–Shenzhen HSR which opened in 2013. Futian railway station was completed by the end of 2015 and began to operate high-speed trains to Hong Kong in 2018. It is completely underground, located in the centre of its namesake Futian District. The central location means it is the focal point for most high-speed train services on the Beijing-Guangzhou-Shenzhen-Hong Kong express rail link route which began plying since 23 September 2018. Connection to West Kowloon Railway Station in Hong Kong which was completed in late 2018, allowed for 15 minute cross-border train journeys. Donghai Airlines, Shenzhen Airlines and Jade Cargo International are located at Shenzhen Bao'an International Airport. The airport is 35 kilometres (22 miles) from central Shenzhen and connects the city with many other parts of China, and serves domestic and international destinations. The airport also serves as an Asian-Pacific cargo hub for UPS Airlines. Shenzhen Donghai Airlines has its head office in the Shenzhen Airlines facility on the airport property. SF Airlines has its headquarters in the International Shipping Center. Shenzhen is also served by Hong Kong International Airport; ticketed passengers can take ferries from the Shekou Cruise Centre and the Fuyong Ferry Terminal to the HKIA Skypier. There are also coach bus services connecting Shenzhen with HKIA. Additionally, Shenzhen is the third largest container port in the world. The city's 260-kilometre (162 mi) coastline is divided by the main landmass of Hong Kong (namely the New Territories and the Kowloon Peninsula) into two halves, the eastern and the western. Shenzhen’s western port area lies to the east of Lingdingyang in the Pearl River Estuary and possesses a deep water harbour with superb natural shelters. It is about 20 nautical miles (40 km) from Hong Kong to the south and 60 nautical miles (110 km) from Guangzhou to the north. By passing Pearl River system, the western port area is connected with the cities and counties in Pearl River Delta networks; by passing On See Dun waterway, it extends all ports both at home and abroad. On the border between Shenzhen and Hong Kong, there are six checkpoints, including two in the railway stations (they both require passengers to walk). In 2006, about 20.5 thousand vehicles crossed the border in both directions daily, of which 65% accounted for trucks, 27% for cars, and the rest — buses (trucks carried 17 thousand containers a day, while the port of Hong Kong handled 23 thousand containers in a day). The busiest border crossings between Shenzhen and Hong Kong were the Huanggang Port (Futian), Futian Port (Futian) and Shatoujiao Port (Yantian) complexes, which accounted for 76%, 18%, and 6% of traffic, respectively (since February 2003, the Huanggang Port complex was work around the clock). Also in 2006, the average daily passenger traffic across the border exceeded 200 thousand people in both directions, of which 63% of traffic came from Luohu Port (Lohu) and 33% to Huanggang Port (78% of those crossing the border were Hong Kong citizens, 20% - citizens of China and 2% - citizens of other countries). In total, in 2006, 153 million people and 14.3 million cars passed through various border points. The large-scale construction work carried out in Shenzhen over the past three decades almost completely destroyed some of the historical architecture that was prevalent in the city before its status of being a special economic zone. Some of the historical buildings in the city are either reconstructions or new models. Despite this, there are still a good number of historical buildings in Shenzhen, primarily in the Nanshan District. Chiwan Fort is located on a small seaside hill in the Nanshan District. Today, what is left only represents a fragment of the large fortress, as it was partially destroyed by the British during the Opium Wars. Tianhou Temple in the Nanshan District is dedicated to the goddess Mazu, a tutelary deity for fishermen and sailors. According to legend, the temple was founded in 1410 by Admiral Zheng He after his fleet survived a strong storm in the Pearl River Delta. The temple is repeatedly rebuilt and repaired. Part of the temple was converted to a museum, but the rest still continues to function as a religious building. The tomb of the last emperor of the Southern Song Dynasty, Zhao Bing, is located in the Nanshan district. The modern tomb dates back to the end of the 19th century, when a Hong Kong clan announced one of the imperial tombs after a long search, though this is disputed by historians. The tomb was reconstructed at the beginning of the 20th century, but later it fell into neglect until it was restored again in the 1980s. Dapin Fortress is located in the eastern part of the city, in the same area. It was built in 1394 to protect the coast from pirates and in 1571 suffered a long siege of Japanese corsairs. It later turned into a typical town during the Qing Dynasty, and during the First Opium War, the fortress garrison participated in the fight against the British. Walls and gates, narrow streets, temples, and the residence of the commandant in the fortress are still preserved today. There is an old fortified Hakka village in the Longgang District, whose the architectural features of which are complemented by the Hakka Culture Museum. The old town of Nantou (or Xin'an), located in the Nanshan District, has several historical sites dating back to the Ming and Qing Dynasties. From the 4th century, there existed a significant city, but today most of the old buildings have been replaced by modern buildings. However, there are still a few historical buildings, such as fortress walls and gates dating back to the Ming period, the Guandi Temple (Guan Yu), some military and civilian buildings (for example, the residence of officials, the shop, and the opium house), and several streets. The tallest building in Shenzhen is the 599-meter, 115 floor Ping An Finance Centre, which is also the second tallest in China and the fourth tallest building in the world. The second-tallest building is the Kingkey 100, rising 441.8 metres (1,449 ft) and containing 100 floors of office and hotel spaces. Shenzhen is also the home to the Shun Hing Square (Diwang Building), the tallest in Asia (if the antenna is taken into account) when it was built in 1996. Most of the city's skyscrapers are concentrated in Nanshan, Luohu and Futian districts. SEG Plaza, in Huaqiangbei, is also a noted landmark at a height of 356 meters (291.6 meters to roof-top). Guomao Building was furthermore the tallest building in China when it was completed in 1985. There is a significant number[vague] of supertalls either proposed, approved or under construction that are well over 300 m (984 ft) in Shenzhen. Ones that have been completed or topped out since 2014 include the China Resources Headquarters, Riverfront Times Square, China Chuneng Tower, Hanking Center, Hon Kwok City Center, Chang Fu Jin Mao Tower, Zhongzhou Holdings Financial Center, East Pacific Business Center, One Shenzhen Bay Tower 7 and Shum Yip Upperhills, among others. There were more skyscrapers completed in Shenzhen in the year 2016 than in the whole of the USA and Australia combined, such is the rate at which the skyline is being transformed. Shenzhen offers free admission to over of its twenty public city parks such as People's Park, Lianhuashan Park, Lizhi Park, Zhongshan Park, and Wutongshan Park. The Xianhu Botanical Garden (仙湖; 'Fairy Lake'), founded in 1982, is spread around the lake of the same name in the Luohu District on an area of 590 hectares. On one of the hills of the garden is Hunfa Temple, the largest Buddhist temple in Shenzhen, which was built in 1985 on the site of an older shrine. Around the lake are a pagoda, tea houses, pavilions, the Museum of Paleontology, a garden of medicinal plants and an azalea garden. Wutongshan National Park (梧桐山) is spread around the mountain of the same name in the Luohu District. From the observation deck, there is a view of the Shenzhen skyline as well as Hong Kong and the surrounding bay, and on the next peak there is a transmission tower of a local television station. Lianhuashan Park (莲花山; Lotus Hill) is located on the territory of 150 hectares in the Futian District. At the top of the mountain is a large bronze statue of Deng Xiaoping. The Shenzhen Garden and Flower Exposition Center, established in the Futian District in 2004 for the International Garden Exhibition, has many gardens of various styles, artificial ponds and waterfalls, a pagoda, pavilions, and statues. The Shenzhen Bay Park opened in 2011 which included the nearby Mangrove Park. There are several thematic recreation areas and attractions, and along the 9-kilometer-long coastal strip there is an embankment. The Mangrove Ecopark was established in 2000 in the Futian District and at that time was the smallest national park in China. A large group of birds migrate to the ecopark in the mangroves on an area of 20.6 hectares in a 9-kilometer coastal zone of the Shenzhen Bay. The Shenzhen Safari Park in the Nanshan District combines a zoo and a large zoological center on a territory of 120 hectares. Xili Lake Resort (西丽湖), located in the Nanshan District, has a park with springs and waterfalls stretching around the lake, surrounded by a canopy, and a pagoda and a pavilion located on the top of Xili Mountain. Zhongshan Park (中山), located in the Nanshan District, is the city’s oldest park. It has several artificial lakes and ponds, an old city wall dating back to the 14th century, and many sculptures and monuments, including one of Sun Yat-sen. The Yangtai Mountain Forest Park is located around the 500-meter Yangtai Mountain (羊台山) in the Bao'an District. Nearby the mountain is Shiyan Lake (石岩湖), which became a popular place of Xin'an County in the 16th century. It is famous for its several indoor and outdoor pools with hot thermal waters. Some of Shenzhen's most prominent themes parks are part of Overseas Chinese Town (OCT), a colloquial name for parks mostly located in the Nanshan District owned by OCT Enterprises and classified as an AAAAA scenic area by the China National Tourism Administration, such as the Window of the World and the Splendid China Folk Village. Opened in 1994, the Window of the World has about 130 reproductions of some of the most prominent tourist attractions in Shenzhen squeezed into 48 hectares (118 acres), as well as hosting various festivals and performances. The Splendid China Folk Village has many miniature versions of the main architectural landmarks of China and buildings with styles of all 56 ethnic groups of China, and hosts numerous cultural festivals and shows. Happy Valley (欢乐谷), opened in 1998, has attractions and sports zones organized into zones such as Spanish Square and Cartoon City, and also hosts various shows. OCT East is the only OCT development located outside of the Nanshan District. Located in the Yantian District, OCT East is an events hotspot, featuring the Ecoventure Valley (大侠谷) and the Tea Stream Resort Valley (茶溪谷) theme parks, three scenic themed towns, two 18-hole golf courses and eight themed hotels. OCT East was joined in 2012 by the OCT Bay (欢乐海岸; reamed OCT Harbor) development, which brought more attractions including an exhibition center, hotels and residences, an artificial beach called CoCo Beach, and an IMAX cinema. Other theme parks include Shekou Sea World (海上世界), a western-style entertainment complex built around a former French ferry now known as Minghua (明华), which was cemented into the ground to become a hotel complex, and Xiaomeisha Sea World, which opened in 1998 on Xiaomeisha Beach (小梅沙; 'small mesa') in the Yantian District, and includes numerous attractions and aquariums such as the Ocean Theater, the Museum of Science and Technology, the Aircraft Model Museum, the World of Ocean Dreams, the Ocean Garden, the Garden of Poseidon, and the Island of Turtles. Minsk World is a military-themed park in the Yantian District based around the decommissioned aircraft carrier Minsk. Initially popular, attracting more than five million visitors and generated ¥450 million in revenue in 2005, the park closed in 2016 after a decline in visitor numbers. Minsk was moved to Zhoushan for repairs, after which it will be moved to another theme park in Nantong, Jiangsu and the land that was used for Minsk World would be reclaimed by the local government. 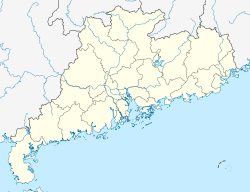 Shenzhen has several beaches: Dameisha (大梅沙; 'big mesa') and Xiaomeisha (小梅沙; 'small mesa') in the Yantian District, and Jinshawan (金沙湾; 'golden sands bay'), Nan'ao (南澳; 'southern inlet'), and Xichong (西冲) in Dapeng Peninsula (in the vicinity of Dapeng New District, which is administered by the Longgang District). Over 170 different festivals and fairs are held annually in Shenzhen, including the Shenzhen International Tourism Cultural Festival, the Beach Music Festival, the Window of the World International Beer Festival, and the Overseas Chinese Town Carnival. The city has more than 630 libraries and bookstores, with the Shenzhen Library, the Shenzhen Book City, the Shenzhen Scientific-Technical Library, the Library of the Shenzhen University, the Shenzhen Children's Library, and the Luohu District Library being among the largest. Cultural facilities such as the Shenzhen Cultural Center, the Shenzhen Convention and Exhibition Center, and the Shenzhen Children's Palace are located in the Futian District, which is considered the cultural center of the city. Overseas Chinese Town is a cluster of cultural theme parks centralized mainly around the Nanshan District. Dafen Village in the Longgang District is famous a noted art village known primarily for the production of replicas of masterworks and outsourcing of original art creation. The Shenzhen Symphony Orchestra (深圳交响乐团), founded in 1982, is a noted orchestra that performs in the Shenzhen Grand Theater. Due to investments made by Hongkongers in the 1980s, Shenzhen is today China’s largest center for the production of cartoons, animation, and computer game software. As with Hong Kong and the surrounding Guangdong province, the main cuisine of Shenzhen is Cantonese. However, due to the recent growth of migrants to the city, Shenzhen also hosts a diverse array of cuisines, from Chinese cuisines such as Chaozhou cuisine, Hakka cuisine, Sichuan Cuisine, Hu Cuisine, and Xiang Cuisine, as well as foreign cuisines such as Korean, Japanese, and French. Street food is also common in Shenzhen, with food stalls lining up on the city's streets. The Yantian District is known for its Chaozhou-based and Hakka-based seafood, with restaurants lined up along the coastline. Some recreational areas in Shenzhen such as Xianhu Botanical Garden, Donghu Park, and Xiaomeisha, host barbecues where visitors bring their own food. Shenzhen also has its own tea culture. Shenzhen has an advanced public media network, boasting one radio station, two TV stations, three broadcasting and TV centers, 19 cable broadcasting and TV sub-stations. In Shenzhen, there are 14 newspapers, one comprehensive publishing house, three video-audio products publishing houses, 88 bureaus of inland and Hong Kong media organizations, 40 periodicals, and about 200 kinds of in-house publications of which the majority belong to enterprises. The most prominent media companies in Shenzhen are the Shenzhen Media Group, the Shenzhen Press Group, China Entertainment Television (CETV), and Phoenix Television branch iFeng. Shenzhen News [zh] (深圳晚报, sznews.com) is a Chinese-language newspaper owned by the Shenzhen Press Group that serves as Shenzhen's main online new source. Shenzhen Daily is an English-language news outlet for Shenzhen. It also covers local, national and international news. ShekouDaily.com is an online media outlet providing news and resources that focus on the Shekou sub-district in Nanshan District of Shenzhen. The planned Shenzhen Universiade Sports Center Gymnasium will be one of the venues for the 2019 FIBA Basketball World Cup. Shenzhen has two local football clubs, Shenzhen F.C. and Shenzhen Renren F.C., who both play home games at the 40,000 capacity Bao'an Stadium. Shenzhen F.C. was one of the earliest professional football clubs in Guangdong, originally owned by memberships, later turned to shareholding. The team won Chinese Super League title in 2004 season despite severe financial problems leaving players unpaid for seven months. The team currently plays in the Chinese Super League, the highest tier of Chinese football competition system. Shenzhen Stadium is a multi-purpose stadium that hosts many events. The stadium is located in Futian District and has a capacity of 32,500. It was built in June 1993, at a cost of 141 million RMB. The 26th Summer Universiade was held in Shenzhen in August 2011. Shenzhen has constructed the sports venues for this first major sporting event in the city. Shenzhen Dayun Arena is a multipurpose arena. It was completed in 2011 for the 2011 Summer Universiade. It is used for the basketball, ice hockey and gymnastics events. The arena is the home of the Shenzhen KRS Vanke Rays of the Canadian Women's Hockey League. From 2019 to 2028 Shenzhen is hosting the WTA Finals, a major annual professional tennis tournament for the world's most top-ranked female players. Shenzhen has been very active in cultivating sister city relationships. In October 1989, Shenzhen Mayor Li Hao and a delegation traveled to Houston to attend the signing ceremony establishing a sister city relationship between Houston and Shenzhen. Houston became the first sister city of Shenzhen. Up to 2015, Shenzhen has established sister city relationship with 25 cities in the world. ^ "ShenZhen Government Online". Archived from the original on 25 May 2017. Retrieved 25 May 2015. ^ Fish, Isaac Stone (25 September 2010). "A New Shenzhen". Newsweek. Retrieved 29 April 2014. Shenzhen grew over the past three decades by capitalizing on both its advantageous coastal location and proximity to Hong Kong and Taiwan (major sources of investment capital), but also on the huge Chinese government support that came with its designation as the first Special Economic Zone. ^ a b Li, Zhu (李注). 深圳将提高户籍人口比例 今年有望新增38万_深圳新闻_南方网. sz.Southcn.com. Retrieved 18 April 2017. ^ a b 深圳大幅放宽落户政策 一年户籍人口增幅有望超过10%. finance.Sina.com.cn. Retrieved 18 April 2017. ^ "Shenzhen". U.S. Commercial Service. 2007. Archived from the original on 12 April 2015. Retrieved 28 February 2008. ^ "Lonely Planet names Shenzhen as a top city to visit in 2019". ^ "Shenzhen Continues to lead China's reform and opening-up". Retrieved 9 September 2016. Shenzhen, [...] which was just a small town when it was chosen as China's first special economic zone to pilot the country's reform and opening-up drive 22 years ago, has now grown into a boomtown, which is placed fourth among Chinese cities in overall economic strength. ^ a b Compare: "The next Silicon Valley? It could be here". Das Netz. 11 July 2017. Worldwide, 16 cities are in the starting blocks in the race to become the next Silicon Valley. [...] That Shenzhen is being treated as the Chinese Silicon Valley should come as no surprise. ^ "Inside Shenzhen: China's Silicon Valley". The Guardian. Retrieved 25 May 2015. ^ "The JOC Top 50 World Container Ports". Retrieved 25 May 2015. ^ 深圳地名网 (27 May 2010). 深圳地名. Shenzhen People's Government. Archived from the original on 4 October 2011. Retrieved 14 November 2011. ^ a b c d e 深圳概貌. Shenzhen People's Government. 12 July 2011. Archived from the original on 4 November 2011. Retrieved 25 October 2011. ^ a b c d e 深圳历史沿革. China Central Television. 7 August 2003. Retrieved 25 October 2011. ^ Stoltenberg, Clyde D. (1984). "China's Special Economic Zones: Their Development and Prospects". Asian Survey. 24 (6): 637–654. doi:10.2307/2644396. ISSN 0004-4687. ^ Holmes, Frank (21 April 2017). "China's New Special Economic Zone Evokes Memories Of Shenzhen". Forbes. Retrieved 22 March 2019. ^ "The spirit of enterprise fades: Capitalism in China". The Economist. 394 (8666): 61. 23 January 2010. Retrieved 28 January 2010. ^ Yeung, Yue-man (Fall 2009). "China's Openness and Reform at 30: Retrospect and Prospect". China Review. Chinese University Press. 9 (2): 160. JSTOR 23462283. ^ "UN report: World's biggest cities merging into 'mega-regions'". Retrieved 9 September 2016. ^ Singh, Harminder (2 September 2016). "Explained:how Hong Kong's Legislative Council has evolved". South China Morning Post. Retrieved 29 March 2019. ^ "Legislative Council of the Hong Kong Special Administrative Region – History of the Legislature". Retrieved 25 May 2015. ^ Perry, Alex (7 May 2001). "Crossing The Line". Time Asia. Archived from the original on 3 June 2001. Retrieved 15 November 2018. ^ "Universiade Shenzhen 2011". Retrieved 19 June 2016. ^ 深圳概貌 [Shenzhen overview]. Retrieved 25 September 2018. ^ 市情概貌. Archived from the original on 20 September 2016. Retrieved 9 September 2016. ^ 深圳310条河流 173条黑脏臭 径流小是先天的硬伤. Retrieved 9 September 2016. ^ a b c [气候统计] 深圳市气候资料（来源：深圳市气象局） (in Chinese). Shenzhen Meteorological Bureau. Archived from the original on 3 July 2015. Retrieved 14 May 2015. ^ "Extreme Temperatures Around the World". Retrieved 4 February 2014. ^ Martin, Michael. "Understanding China's Political System" (PDF). Congressional Research Service. Retrieved 13 September 2011. ^ 中华人民共和国县以上行政区划代码. Ministry of Civil Affairs. ^ Shenzhen Bureau of Statistics. 《深圳统计年鉴2014》. China Statistics Print. Retrieved 29 May 2015. ^ 深圳政府在线 [Shenzhen government official]. Retrieved 25 September 2018. ^ "Official PRC announcement". gov.cn. Retrieved 9 January 2011. ^ 二线关景观改造方案出炉 涉及8个主要的二线关口 [The plans for the ErXianGuan landscape reconstruction have been announced, involving 8 major former border passages]. 深圳本地宝 (sz.bendibao.com). 2 March 2016. Retrieved 31 March 2016. ^ "Shenzhen to remove outdated boundary around economic zone - Chinadaily.com.cn". www.chinadaily.com.cn. Retrieved 16 January 2018. ^ 国务院关于同意撤销深圳经济特区管理线的批复（国函〔2018〕3号）_政府信息公开专栏. www.gov.cn. Retrieved 16 January 2018. ^ 深圳规划合并关内关外取消区级政府. Retrieved 10 September 2016. ^ Wei Ge (1999). "Chapter 4: The Performance of Special Economic Zones". Special Economic Zones and the Economic Transition in China. World Scientific Publishing Co Pte Ltd. pp. 67–108. ISBN 978-9810237905. ^ Yeandle, Mark. "GFCI 19 The Overall Rankings". www.longfinance.net. Archived from the original on 8 April 2016. Retrieved 27 May 2017. ^ "SZSE Overview". Retrieved 10 September 2016. ^ "# of +200m Buildings". CTBUH. Retrieved 3 June 2012. ^ "Contact us Archived 26 October 2008 at the Wayback Machine." Huawei. Retrieved on 4 February 2009. ^ "Guangdong - Shenzhen High-tech Industrial Park". Retrieved 10 September 2016. ^ "". Retrieved on 5 July 2014. ^ Chaney, Joseph (15 June 2015). "Shenzhen: China's start-up city defies skeptics". CNN. ^ "HAX Accelerator". Official website of HAX. Retrieved 24 June 2015. ^ "Shenzhen Software Park". Retrieved 25 May 2015. ^ 香港政府一站通 [one-stop portal of the Hong Kong SAR Government]. GovHK. Retrieved 5 May 2010. ^ 深圳九大口岸通关攻略. Retrieved 9 September 2016. ^ a b "Hong Kong International Airport – Your Regional Hub with Worldwide Connections and Gateway to China". Hongkongairport.com. Retrieved 5 May 2010. ^ a b Fung, Anita. "Qianhai Taking RMB Internationalisation to the Next Level". New Zealand China Trade Association. Retrieved 11 June 2014. ^ Tse, Constant. "State Council Approves Preferential Policies for Qianhai Shenzhen-Hong Kong Modern Service Industry Cooperation Zone". Deloitte. 169. ^ "Age Composition and Dependency Ratio of Population by Region (2004)". China Statistics 2005. Retrieved 5 July 2010. ^ "Cross-border Commuters Live Hard between Hong Kong and Shenzhen | Feed Magazine - HKBU MA International Journalism Student Stories". journalism.hkbu.edu.hk. Retrieved 27 May 2017. ^ 广东省公安厅出入境政务服务网. www.gdcrj.com. Retrieved 27 May 2017. ^ 深圳客家人的來歷和客家民居 [Hakka Origins and Settlements in Shenzhen]. 中國國際廣播電臺國際線上. Retrieved 16 April 2012. ^ 圍頭話 Weitou dialect. Retrieved 16 April 2012. ^ 張 ZHANG, 則武 Zewu. 浅谈深圳城中村的成因及其影响 A Discussion concerning the History and Consequences of Urban Villages in Shenzhen. Archived from the original on 4 August 2012. Retrieved 16 April 2012. ^ 秦 CHUN, 炳煜 Bing Yuk (7 July 2006). 深圳成粵語圈中普通話區 Shenzhen becomes the Mandarin area in a Cantonese region. 文匯報 Wenweipo. Retrieved 16 April 2012. ^ 深圳將粵語精髓融入普通話 Shenzhen Incorporates Cantonese Essence into Mandarin. 南方網. 15 February 2012. Retrieved 16 April 2012. ^ 中华人民共和国国家通用语言文字法 The National Lingua Franca and Orthography Act-- People's Republic of China. Standing Committee of the National People's Congress. Archived from the original on 18 May 2012. Retrieved 3 May 2012. ^ He, Huifeng. "Trendy Shenzhen teenagers spearhead Cantonese revival". South China Morning Post. South China Morning Post. Retrieved 16 June 2013. 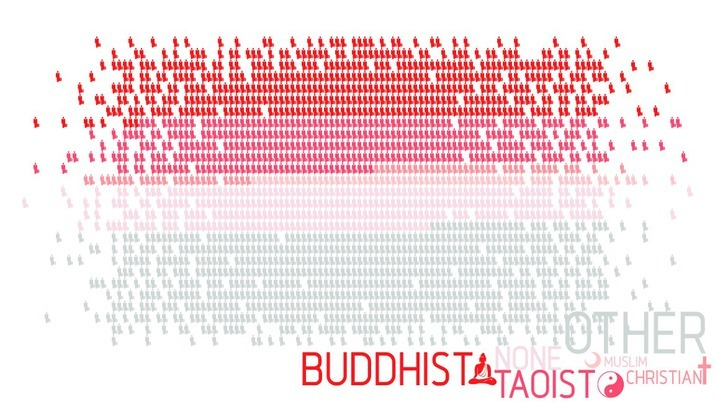 ^ a b Demographics of religion in Shenzhen (archived) for the "6 under 60" research project by the University of Southern California. See also Lani Heidecker's data for the Shenzhen Geography Project (archived). ^ 中共深圳市委统战部（市民族宗教事务局、市侨务办公室、市侨联）. www.tzb.sz.gov.cn. Retrieved 27 May 2017. ^ Lizhu, Fan; Whitehead, James D. (2004). "Fate and Fortune: Popular Religion and Moral Capital in Shenzhen". Journal of Chinese Religions. 32: 83–100. doi:10.1179/073776904804759969. ^ Payette, Alex. "Shenzhen's Kongshengtang: Religious Confucianism and Local Moral Governance". Role of Religion in Political Life, Panel RC43, 23rd World Congress of Political Science, 19–24 July 2014. ^ "CRIME.VL.RU - Transnational manifestations of Chinese organized crime". www.crime.vl.ru. Retrieved 13 December 2018. ^ "CRIME.VL.RU - Transformation of Triads". www.crime.vl.ru. Retrieved 13 December 2018. ^ "WebCite query result". www.webcitation.org. Archived from the original on 31 May 2012. Retrieved 13 December 2018. ^ "The Illuminated Lantern: Triads". www.illuminatedlantern.com. Retrieved 13 December 2018. ^ "В Китае за взятки арестован мэр города, считавшегося "витриной" экономических реформ". NEWSru.com. 8 June 2009. Retrieved 13 December 2018. ^ "Глава государственной строительной корпорации приговорен к смертной казни". NEWSru.com. 14 December 2002. Retrieved 13 December 2018. ^ "WebCite query result". www.webcitation.org. Archived from the original on 25 May 2012. Retrieved 13 December 2018. ^ 深圳大学. www.szu.edu.cn. Retrieved 13 December 2018. ^ "Shenzhen Metro Now Supports QR Code Payment, Here's How it Works". That's Online. Retrieved 25 March 2019. ^ "How to Pay Bus Fare with Your Phone in Shenzhen". That's Online. Retrieved 25 March 2019. ^ "City to spend 48b yuan on 3 Metro lines". Shenzhen Daily. Archived from the original on 15 July 2013. Retrieved 28 July 2012. ^ "Shenzhen Metro". exploremetro. Retrieved 27 May 2014. ^ 深圳地铁7、9、11号线2016年底开通. Retrieved 9 September 2016. ^ 广东省深圳市人民政府关于印发《深圳市公交行业特许经营改革工作方案》的通知. www.chinalawedu.com. Retrieved 8 June 2018. ^ a b 深圳"红绿的"5日起统一收费（图）--部门动态. www.sz.gov.cn (in Chinese). Retrieved 8 June 2018. ^ PST, Adnan Farooqui on 01/06/2019 08:15. "Shenzhen's Taxi Fleet Goes Fully Electric As Well". Ubergizmo. Retrieved 7 January 2019. ^ 深圳“红绿的”5日起统一收费（图）--部门动态. www.sz.gov.cn (in Chinese). Retrieved 7 June 2018. ^ "Shenzhen imposes limits on purchases of new cars". ^ Zong, Chuanling (宗传苓); Tan, Guowei (谭国威); Zhang, Xiaochun (张晓春) (2011). 基于城市发展战略的深圳高铁枢纽规划研究——以深圳北站和福田站为例[J]. 规划师 (27(10)): 23–29. ^ 广州深圳升级为半小时城市圈. Archived from the original on 24 December 2013. Retrieved 25 May 2015. ^ "Buji Station renamed Shenzhen East ---szdaily多媒体数字报刊平台". Archived from the original on 13 January 2015. Retrieved 25 May 2015. ^ "More ticket counters at Hong Kong terminus of high-speed rail link after chaotic first day marked by queues and ticket confusion". South China Morning Post. 24 September 2018. Retrieved 27 September 2018. ^ "High-speed rail set to bring bumper 'Golden Week' for Hong Kong tourism as mainland Chinese visitors snap up tickets for first day". South China Morning Post. 24 September 2018. Retrieved 27 September 2018. ^ "Contact Us." Shenzhen Airlines. Retrieved on 9 September 2009. ^ "Contact Us Archived 11 April 2009 at the Wayback Machine." Jade Cargo International. Retrieved on 11 July 2010. ^ "UPS Launches Shenzhen Flights". Ups.com. 8 February 2010. Archived from the original on 24 July 2011. ^ "Contact Us." SF Airlines. Retrieved on 24 February 2014. "SF Airlines Co., Ltd. Address: No.1 Freight Depot, International Shipping Center of Bao'an International Airport, Shenzhen, Guangdong Province, 518128, P.R.C." – Chinese address: "地 址：中国广东省深圳市宝安国际机场国际货运中心1号货站 邮 编：518128"
^ "[SZ] Cruise terminal operational in Nov". Guangdong news. 17 August 2016. Retrieved 27 September 2018. ^ 2013年最新深圳福永码头时刻表-深圳福永码头去澳门-深圳福永码头到香港-福永口岸通关时间_深圳指南_深圳热线. life.szonline.net. Retrieved 17 September 2017. ^ "Top 50 container ports in the world". www.worldshipping.org. World shipping council / Journal of commerce. Retrieved 27 September 2018. ^ "Home | Census and Statistics Department". www.censtatd.gov.hk. Retrieved 1 December 2018. ^ "Ports and Transportation". Archived from the original on 24 September 2015. Retrieved 1 December 2018. ^ "Shenzhen Travel Guide: Attractions, History, Tips, Visa on Arrival". www.travelchinaguide.com. Retrieved 1 December 2018. ^ "Левый форт Чивань / Chiwan Left Fort / Шэньчжэнь | Культурный туризм". tuorism.ru (in Russian). Retrieved 1 December 2018. ^ "Храм Чивань Тянь Хоу гун / Chiwan Tianhou Temple / Шэньчжэнь | Культурный туризм". tuorism.ru (in Russian). Retrieved 1 December 2018. ^ "Tomb of the Young Song Emperor | Sightseeing | Shenzhen, Shekou Entertainment, Food and Lodging". www.shenzhenparty.com. 4 August 2011. Retrieved 1 December 2018. ^ "Tomb of the Young Song Emperor | Wiki Shenzhen". www.wikishenzhen.com. Retrieved 1 December 2018. ^ "Dapeng Fortress | Sightseeing | Shenzhen, Shekou Entertainment, Food and Lodging". www.shenzhenparty.com. 10 February 2013. Retrieved 1 December 2018. ^ "Crane Lake Fortified Hakka Village & Hakka Culture Museum". Archived from the original on 11 August 2017. Retrieved 1 December 2018. ^ "Crane Lake Fortified Hakka Village & Hakka Culture Museum | Culture/Museums | Shenzhen, Shekou Entertainment, Food and Lodging". www.shenzhenparty.com. 24 March 2017. Retrieved 1 December 2018. ^ "Ancient City of Nantou (Xin'an)". www.chinaexpeditiontours.com. Retrieved 1 December 2018. ^ "Xin'an Ancient City". Archived from the original on 7 September 2011. Retrieved 1 December 2018. ^ Прогулка по древнему городу Наньтоу, Шэньчжэнь « News In Photo. newsinphoto.ru (in Russian). Retrieved 1 December 2018. ^ "Ping An Finance Center - The Skyscraper Center". www.SkyscraperCenter.com. Retrieved 17 September 2017. ^ "KK100 – The Skyscraper Center". CTBUH. Retrieved 29 August 2013. ^ "Shun Hing Square (Diwang/Di Wang Commercial Center)". Retrieved 10 September 2016. ^ 深圳摩天大楼列表，深圳第一高楼. top.gaoloumi.com. Retrieved 21 January 2016. ^ "SEG Plaza – The Skyscraper Center". Council on Tall Buildings and Urban Habitat. Archived from the original on 23 October 2012. ^ 深圳30年：深圳国贸大厦. Retrieved 10 September 2016. ^ Robinson, Melia (17 January 2017). "One Chinese city built more skyscrapers in 2016 than the US and Australia combined". Business Insider. Retrieved 16 March 2018. ^ "Буддистский храм Хунфа / Hongfa Buddhist Temple / Шэньчжэнь | Культурный туризм". tuorism.ru (in Russian). Retrieved 1 December 2018. ^ "Fairy Lake Botanical Gardens Shenzhen". Retrieved 1 December 2018. ^ "Wutong Mountains". Archived from the original on 7 May 2012. Retrieved 1 December 2018. ^ "Lianhua Mountain Park | Wiki Shenzhen". www.wikishenzhen.com. Retrieved 1 December 2018. ^ "LateRooms - Book Cheap Hotels & Last Minute Hotel Deals". www.asiarooms.com. Retrieved 1 December 2018. ^ "Lotus Hill". Archived from the original on 15 March 2018. Retrieved 1 December 2018. ^ "Shenzhen Garden and Flower Exposition Center". Retrieved 1 December 2018. ^ "Shenzhen Bay Park". Archived from the original on 11 July 2011. Retrieved 1 December 2018. ^ "Shenzhen Bay Park". Archived from the original on 9 September 2011. Retrieved 1 December 2018. ^ "Shenzhen Mangrove Seaside Ecology Park". Archived from the original on 15 July 2012. Retrieved 1 December 2018. ^ "Shenzhen Safari Park, Wildlife Zoo, Guangdong". www.travelchinaguide.com. Retrieved 1 December 2018. ^ Кто такие лигры и тигоны?. www.vokrugsveta.ru (in Russian). Retrieved 1 December 2018. ^ "Xili Lake Holiday Resort, Shenzhen, Guangdong". www.travelchinaguide.com. Retrieved 1 December 2018. ^ "Yangtai Mountain Forest Park | Wiki Shenzhen". www.wikishenzhen.com. Retrieved 1 December 2018. ^ "Shiyan Lake Hot Spring Resort | Wiki Shenzhen". www.wikishenzhen.com. Retrieved 1 December 2018. ^ "AAAAA Scenic Areas_National Tourism Administration of The People's Republic of China". 4 April 2014. Archived from the original on 4 April 2014. Retrieved 8 December 2018. ^ "Window of the World". Archived from the original on 15 June 2011. Retrieved 2 December 2018. ^ "Window of the World, Shenzhen, Guangdong, Theme Park". www.travelchinaguide.com. Retrieved 3 December 2018. ^ "Splendid China - Folk Culture Villages, Shenzhen". www.travelchinaguide.com. Retrieved 3 December 2018. ^ "Splendid China folk culture village". Archived from the original on 24 March 2010. Retrieved 2 December 2018. ^ 欢乐谷官方网站. www.happyvalley.cn (in Chinese). Retrieved 3 December 2018. ^ "Shenzhen Happy Valley, Theme Park: Ticket Price, Get There". www.travelchinaguide.com. Retrieved 3 December 2018. ^ "Buzz on the waterfront". TTGmice. Archived from the original on 5 June 2013. Retrieved 27 March 2013. ^ "About us". Szseaworld.com. Archived from the original on 20 April 2011. Retrieved 5 May 2010. ^ "Shekou Sea World | Wiki Shenzhen". www.wikishenzhen.com. Retrieved 4 December 2018. ^ 小梅沙海洋世界官方网站｜深圳小梅沙海洋公园官网｜深圳海洋世界官网｜深圳市特发小梅沙旅游发展有限公司. www.szxms.com.cn. Retrieved 8 December 2018. ^ "Xiaomeisha Sea World, Shenzhen, Guangdong". www.travelchinaguide.com. Retrieved 8 December 2018. ^ "The Standard - Business as usual at sunk Minsk World - China Section". 10 February 2012. Archived from the original on 10 February 2012. Retrieved 4 December 2018. ^ "Aircraft carrier used as Chinese theme park sets sail for new home". South China Morning Post. 4 April 2016. Retrieved 4 December 2018. ^ Karacs, Sarah. "The Most Beautiful Beaches in Shenzhen". Culture Trip. Retrieved 8 December 2018. ^ "WebCite query result". www.webcitation.org. Archived from the original on 25 May 2012. Retrieved 12 December 2018. ^ a b "WebCite query result". www.webcitation.org. Archived from the original on 25 May 2012. Retrieved 12 December 2018. ^ 图书馆之城简介 - 关于图书馆之城 - 图书馆之城 - 全国文化信息资源共享工程深圳中心. 21 August 2017. Archived from the original on 21 August 2017. Retrieved 12 December 2018. ^ report, Evan Osnos, Tribune foreign correspondent; Lu Jingxian contributed to this. "Chinese village paints by incredible numbers". chicagotribune.com. Retrieved 12 December 2018. ^ Fallows, James (19 December 2007). "Workshop of the world, fine arts division". The Atlantic. Retrieved 12 December 2018. ^ "Demand grows for Chinese fake art | China News | Al Jazeera". www.aljazeera.com. Retrieved 12 December 2018. ^ 美食. travel.sohu.com. Retrieved 14 December 2018. ^ 花样百出吃深圳－饮食文化 - 王朝网络 - wangchao.net.cn. www.wangchao.net.cn. Retrieved 14 December 2018. ^ 感受深圳的饮食文化. 2 March 2017. Archived from the original on 2 March 2017. Retrieved 14 December 2018. ^ Daily, Shekou. "Free Entry to the NEW Maritime Museum in Shekou Shenzhen". ShekouDaily.cn. Retrieved 17 September 2017. ^ a b "WebCite query result". www.webcitation.org. Archived from the original on 31 May 2012. Retrieved 18 December 2018. ^ 深圳广播电影电视集团. www.szmg.com.cn. Retrieved 18 December 2018. ^ "WebCite query result". www.webcitation.org. Archived from the original on 31 May 2012. Retrieved 18 December 2018. ^ 凤凰网. www.ifeng.com. Retrieved 18 December 2018. ^ "Shenzhen Daily". Shenzhen Daily. Retrieved 17 December 2018. ^ Daily, Shekou. "ShekouDaily: Bringing you the best of Shekou, Sea World, Shenzhen, China". ShekouDaily.com. Retrieved 17 September 2017. ^ 球队简介——深圳红钻队. 163.com Sports. 25 March 2010. Retrieved 20 August 2013. ^ 健力宝俱乐部欠债累累 中超冠军欲"借钱"过年. sports.sina.com.cn. 26 November 2004. Retrieved 12 August 2014. ^ 硕, 陈 (17 July 2014). 深圳红钻欠薪曝光合计约700万 中国足协介入调查. Xinhuanet. Archived from the original on 13 January 2015. Retrieved 21 July 2014. ^ "2011 Summer Universiade". International University Sports Federation. Archived from the original on 20 September 2010. Retrieved 20 September 2010. ^ "China's Skateboarding Revolution". 20 May 2015. ^ "Shenzhen, China to host WTA Finals starting in 2019". 18 January 2018. ^ "HSSCA". HSSCA. Retrieved 2 June 2017. Wikimedia Commons has media related to Shenzhen. Wikivoyage has a travel guide for Shenzhen. This page was last edited on 19 April 2019, at 01:29 (UTC).